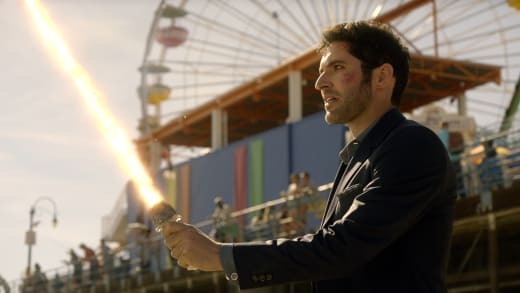 Lucifer finally got his wish on Lucifer Season 2 Episode 18, but it wasn't as easy as he thought. In the end, he didn't want to send his mother away, but he had no choice. Lives were at stake – including Chloe and Linda's. Since the very beginning, Charlotte wanted to go home to heaven and was willing to do it at any cost. Despite having had some feelings for humans, especially Dan, she never felt completely connected to them. That's why she had no problems almost turning Linda to toast to find out what Linda was hiding. It wasn't surprising that Linda tried to protect Lucifer. Even though it almost cost her her life, she didn't regret it. She knew all the secrets and saw how much stress Charlotte's presence was placing on everyone. What Linda didn't bet on was how vicious Charlotte could be or the severity of her selfishness. How Amenadiel was able to turn back time is anyone's guess. Perhaps being entrusted with the key helped him realize how important he was to his father and humanity. He didn't know he'd be able to slow down time but was willing to give it a try to save someone he loved. Amenadiel had no idea what was happening at Santa Monica Pier, but he saved everyone there, too. Amenadiel's powers had been inside him all along. They never went away. He didn't need his wings to summon them. He only needed his inner strength. Perhaps doing improv with Dan might have helped him figure it out. Improve helped Amenadiel arrive at the epiphany that sending Charlotte heaven would not lead to her living there peacefully. Luckily, Lucifer listened to him. Lucifer: Don't make me hurt you. Remember, you're not the angel you once were. Amenadiel: No, Luci, you're right. I'm not. I just need a little time to process what it all means. Lucifer: Process? Okay. Fine. I suppose we're in no real rush. Process away. I've got E.T. on the DVR if you need a good weep and a package of Haagen Daz in the freezer if that helps. She admitted as much right before Lucifer sent her into nothingness where she could build her own world and rule as she wished. It sounded like a better deal than what Lucifer had offered her previously. She wasn't too keen on that idea which makes sense because she was a prisoner there for so long. Even though Lucifer knew the truth of Charlotte's plans, it was still difficult to send her on her way. The idea of never seeing her again pained him deeply, but he did what was necessary. I thought, for one minute, that he was going to strike her down but was glad he had an alternative plan. You have to wonder if the decision not to strike her down will come back to haunt him. Lucifer knew his mother loved him, but his love for Chloe and Linda far outweighed his love for her. Still, it was sad to watch them say goodbye. Chloe had no clue what was going on almost the entire episode. In fact, she was almost like a secondary character this hour even though she was a main player in the overall arc. That's the whole point though, isn't it – that she's a main character without even knowing it? She keeps going along without any idea of what's happening around her. She knows there's something odd about Lucifer, but she's not willing to delve deeper. She knows what's she's seen in the past, and it's annoying that Lucifer would have to sit down and spell it out for her. We know that had he not gotten knocked out and sent to wherever he was sent to, he would have shown his true face to her. But would she have believed it? We're never going to know now. At least not until Lucifer returns to L.A., but by then it might be too late. Where is he, anyway? Is he in heaven? Or is he in Charlotte's new world? Or is he in his own hell? Who put him there and why? Surprisingly, considering he burned them during Lucifer Season 1, he has his wings again. Chloe isn't going to be too forgiving about Lucifer disappearing again. This might be the last straw for her no matter what Linda, Maze and Amenadiel try to tell her. Maybe they'll tell her the truth about themselves, but knowing Chloe, she'll just think she's finally cracked under the pressure of her life. I'm glad that Linda was able to survive Charlotte's wrath. It didn't look too good when Maze found her with a hole in her stomach. Maze's face when she found Linda said everything I was feeling. It was soul-crushing that Dr. Linda might not make it. It would not have been the same without the sunshine of Dr. Linda. 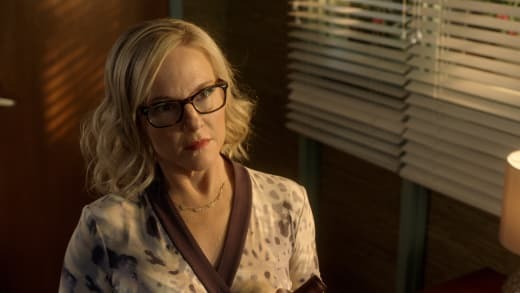 What do you expect Linda's role might be during Lucifer Season 3? She can't practice psychology anymore, so what will she do? Will she be the one tracking down Lucifer? Or will she be the one to help usher Chloe into her new reality? How will anyone even find Lucifer? Where do they even begin? Going backwards, Lucifer, is not good. For anyone. Permalink: Going backwards, Lucifer, is not good. For anyone. Are Charlotte and The Flaming Sword gone for good? "The Good, the Bad and the Crispy" was a rollercoaster of emotions and a wonderful end to a phenomenal sophomore season. Lucifer made great strides by moving even further away from the case-of-the-week format it had relied on its freshman season. 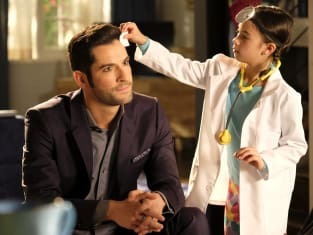 For Lucifer Season 2, each case was valuable to the overall story, making everything a lot more enjoyable, especially with the addition of Ella who provided some great comic relief. 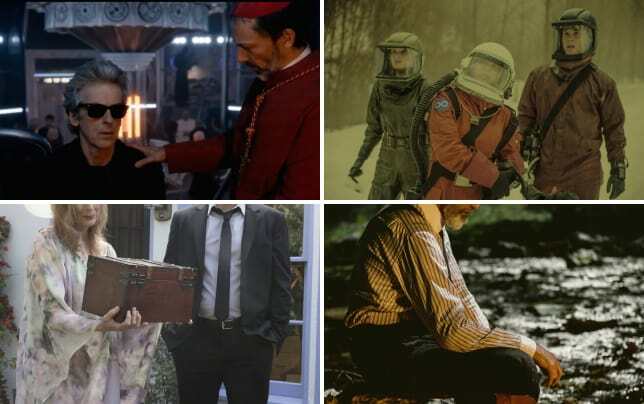 I loved how the show was able to incorporate all the players into a major role at some point in the season. It wasn't focused strictly on Lucifer and Chloe. I also liked that they mixed things up, giving us different pairings of characters. My favorite was the Charlotte and Chloe pairing, but Chloe and Maze working together was a close second. And who didn't like Trixie working her magic with Lucifer? So over to you guys. What did you think about "The Good, the Bad, and the Crispy"? Is Lucifer in Heaven or Hell? How did he get there? Better yet, who put him there? Are you relieved Dr. Linda is okay? 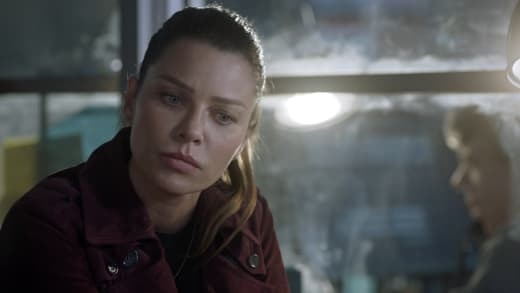 What will Chloe think now that Lucifer is gone again? How did you like the season overall? If you missed anything, you can watch Lucifer online right here via TV Fanatic.